I’m sure this is old and has been sent round before, but, its still good for a chuckle. 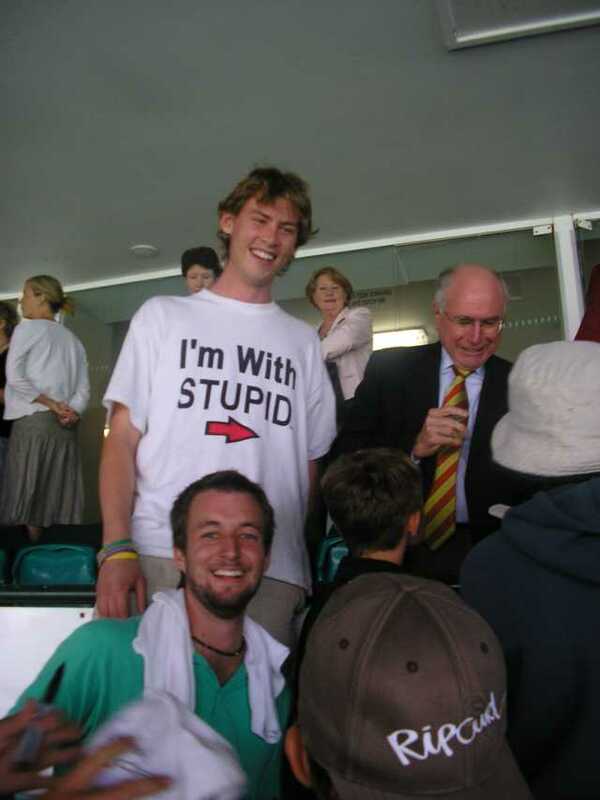 Would be better if it was Peter Costello wearing that t-shirt. That’d be a pretty good photoshop challenge I reckon. Richie, Magda and Richardo are Ubercoolische! Over at Maddox’s “Best Page in the Universe“, he has some great observations on a couple types of nerds, with my favourite being the “I wish I was Japanese” anime nerd. Everyone knows someone like this. They refer to themselves as “otaku” and they embrace everything Japanese, not necessarily because it’s something unique or interesting, but because it’s Japanese. They wear clothing with Japanese or Chinese characters on it that translate to English phrases like “good will” or “long life.” They wouldn’t be able to get away with wearing a shirt that said “long life” in English because it would just look stupid, but as soon as it’s translated into kanji it suddenly becomes cool and mysterious? Please. I have great memories of cicadas from when I was a kid. Green grocers, brown bakers, black tigers. Some were more difficult to find than others. Today I was looking at the Cicadaville site, and it had some facts I didn’t know. FACT: Cicadas are vicious killers. FACT: Cicadas prey on innocent children and pets. FACT: Cicadas are seething with deadly venom and flesh-eating bacteria. FACT: This year Cicadas will kill more people than snakes, spiders, scorpions, and sharks combined! Thanks to Tony for sending that on. Not sure of the original source. From Jamie Zawinski’s blog: “This OJ tastes funny”.